Free Hex Editor Neo is award-winning large files optimized freeware editor for everyone who works with ASCII, hex, decimal, float, double and binary data.Freeware Hex Editor Neo allows you to view, modify, analyze your hexadecimal data and binary files, edit, exchange data with other applications through the clipboard, insert new data and delete existing data, as well as perform other editing actions. Make patches with just two mouse clicks, etc. ...... undo/redo. Taste the visual operation history with branching. 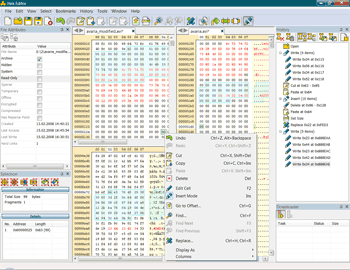 Free Hex Editor Neo Ultimate is hex and binary code data editing software utility for Windows includes the following basic functionality: Unlimited Undo/Redo; Find; Replace; Visual History Save and Load; Patch Creation; Clipboard Operations; Bytes, Words, Double Words, Quad Words, Floats and Doubles Edit Mode. * Allows you to find data patterns in multi-gigabyte files in seconds. It's powerful. * Supports regular expression search across the files. It's handy. * Allows you to make file patches in just one click. It's smart. * Allows you to tune almost any aspect of user interface. It's flexible. * Supports multiple core processing. It's efficient. * Includes all functionality above and costs you nothing. It's inexpensive. Free Hex Editor Neo Ultimate is the only binary files editor that deals with large files faster than any other one! Hex editor to edit hex files with search, drag and drop. Qweas is providing links to Free Hex Editor Neo 5.12.01.4748 as a courtesy, and makes no representations regarding Free Hex Editor Neo or any other applications or any information related thereto. Any questions, complaints or claims regarding this application Free Hex Editor Neo 5.12.01.4748 must be directed to the appropriate software vendor. You may click the publisher link of Free Hex Editor Neo on the top of this page to get more details about the vendor.